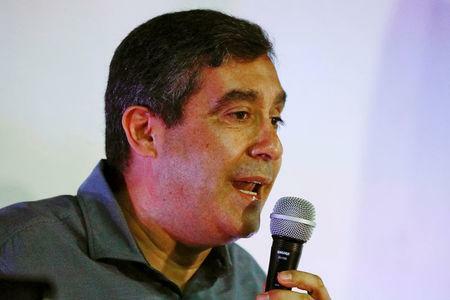 CARACAS (Reuters) - Venezuelan security forces on Tuesday detained Miguel Rodriguez, a dissident former interior minister, on accusations he was conspiring to destabilize the government of unpopular leftist President Nicolas Maduro. The arrest follows last week's detention of nine army officers on charges including treason and rebellion, according to a local rights group, as dissent mounts in parts of the military due to food shortages and hyperinflation. "The criminal actions planned by this man and his accomplices included armed actions and conspiracies against our constitution," the government said in a statement read on state television. It did not provide details or evidence to support the charges. Venezuela's Information Ministry did not reply to a request for comment. Rodriguez was arrested during an event at the President Hotel in Caracas, said Indira Urbaneja, an aide to Rodriguez who witnessed the detention. A video circulating on social media showed agents escorting him into a white van amid commotion. An army major-general who was jailed with late leader Hugo Chavez, Rodriguez in 2014 led a crackdown on opposition protests that set off widespread accusations of arbitrary arrests, inhumane detentions and torture to obtain confessions. But he later broke with the government and created a political movement called Everyone's Challenge. He publicly criticized Maduro and discussed a bid for the presidency, but in February was barred from holding office on alleged administrative irregularities, according to local media. Government officials then accused him of being the mentor of Oscar Perez, a helicopter pilot who led a 2017 attack on government buildings and was killed in a January military operation that opposition leaders described as a massacre. Critics say Rodriguez's detention is further evidence that Maduro has become a dictator. They say the former bus driver and union leader, who lacks Chavez's charisma, is seeking to consolidate his position ahead of May presidential elections by arresting or sidelining dissenters. But the arrest of Rodriguez, once a powerful politician who still retains sympathy from some officials, could also worsen splits within the ruling Socialist Party, once firmly united under Chavez. Maduro, for his part, says his ideological foe the United States is seeking to unseat him to gain control of Venezuela's large oil reserves. In a recent interview with the CNN En Espanol television channel, Rodriguez was asked about the risks he was taking. "If that earns me jail, the government will have to explain what it invented to imprison me," Rodriguez responded at the time.